Game designer (Trail of Cthulhu), horror scholar (Tour de Lovecraft), and Dracula devotee (The Dracula Dossier) Kenneth Hite takes you on an eerie journey through the myth of Dracula! From the first medieval atrocity stories about Vlad the Impaler to Bram Stoker's immortal novel to the most recent Universal blockbusters, The Thrill of Dracula zooms through centuries of blood, bats, and – ballet? — to bring you the most complete look at the Count's story ever! See Dracula take on not just Van Helsing but Batman, Blade, Buffy, Billy the Kid — and Abbott and Costello! the occult mysteries behind Nosferatu, and untangle the shifting time and space of the Hammer Dracula series! Follow Dracula into space, and into Spanish! Geniuses from Orson Welles to Werner Herzog have remade Dracula – now you can, too! Hite gives you their tools, tools you can use to build new yet mythic stories about the King of the Vampires or about your own creatures of the night, tuned for thriller adventure, cosmic horror, or even intense personal drama. 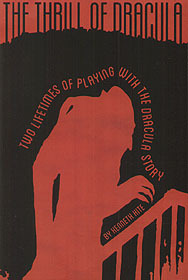 So sharpen your stakes and prepare for the thrill of your Un–Lifetime — The Thrill of Dracula!